Experts recommend using mild cleaning solutions for cleaning wood cabinets such as vinegar and water, detergent mixed with water, baking soda with water or a vegetable oil soap and water. Experts also recommend avoiding commercial products such as spray polishes containing petroleum solvents and abrasive powdered cleansers. Wood cabinets are kept clean by wiping them down with a damp cloth to remove dust, but a cleaning solution is needed when cabinets become sticky from grease and grime. It's best to start off using the mildest cleaning solution, using a stronger solution when needed. 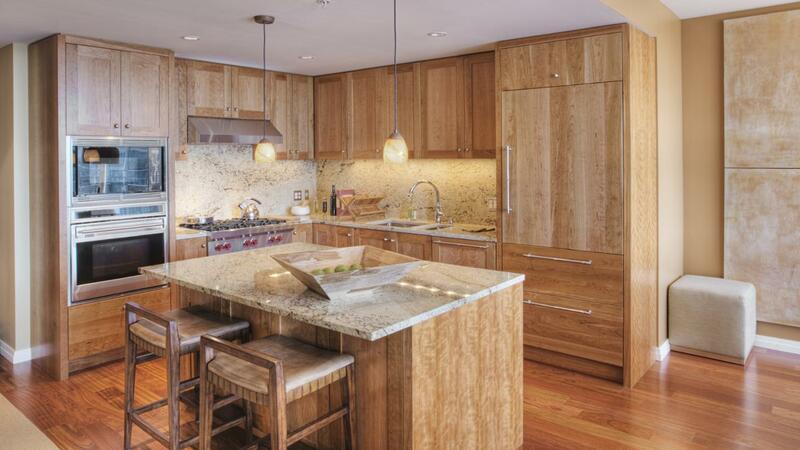 Cleaners made of vegetable oil soap are very gentle on wood cabinetry, and a soapy solution is made using warm water. Handle greasy build up on cabinets by making a cleaning solution of one part vinegar and two parts water, and it's okay to use apple cider or white vinegar. Alternatively, add one cup of grease fighting detergent to two cups of warm water, which gets rid of embedded grease. Creating a cleaning paste out of baking soda and water works fine for attacking tough stains on wood cabinets that milder cleaners are unable to eliminate. Regardless of what type of cleaner is used on wood, it's important to use a soft cloth for scrubbing, and then immediately rinse the cabinets with plain water to remove any residue. What Are Some Good Stain Removal Products for a Wool Carpet? What Is a Good Brass Cleaner to Use at Home? What Is the Best Way to Remove Wallpaper Paste?